At the June 2014 American Medical Association Annual Meeting (AMA) in Chicago, the AMA adopted a policy opposing the sales and marketing of electronic cigarettes (e-cigarettes) and nicotine delivery products to minors. This policy extends one that was adopted in 2010 and discussed in the May, 2013 scienceandyourhealth.com blog entry , that calls for all e-cigarettes to be subject to the same regulations and oversight that the U.S. Food and Drug Administration (FDA) applies to tobacco and nicotine products. In 2010, the AMA Council on Science and Public Health (CSAPH) reviewed AMA Policy related to e-cigarettes, the manufacture and characteristics of e-cigarettes, current regulations and the potential health impacts of these products, and their potential role in smoking cessation. The newly adopted AMA policy also supports product requirements for e-cigarettes and nicotine delivery systems, including: disclosures regarding design, content and emissions; child-proof and tamper-proof packaging and design; enhanced product labeling; restrictions related to flavors that appeal to minors; and, prohibition of unsupported marketing claims as a tobacco cessation tool. Although e-cigarettes have been marketed as smoking cessation aids, there is no conclusive scientific evidence that e-cigarettes promote successful long-term quitting. According to a new UC San Francisco study, e-cigarettes, promoted as a way to quit regular cigarettes, may actually be a new route to conventional smoking and nicotine addiction for teenagers. Researchers found that e-cigarettes were associated with more, not less, cigarette smoking among adolescents. And recently, the Center for Disease Control and Prevention has reported that use of e-cigarettes by students in U.S. middle schools and high schools more than doubled from 3.3 percent in 2011 to 6.8 percent in 2012. The AMA policy supports an FDA proposal to fill the gap in federal regulations on purchasing, labeling, packaging and advertising of electronic cigarettes. The proposed FDA regulation is an important step to improve public health and deter the sale of electronic cigarettes to minors. 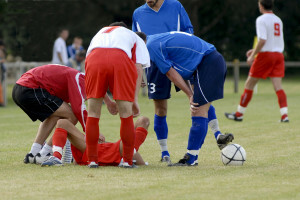 The use of electronic games for health improvement is an area of emerging research. Settings include homes, schools, hospitals, clinics, and community centers. Some games require physical interaction, whereas other games are non-active but are intended to be educational. Games also exist that combine efforts to increase knowledge with changes in attitudes and behaviors. Examples of innovative products include games for school-aged children to learn about nutrition, games for adults to aid in smoking cessation, games for seniors to demonstrate exercise, and games for college students which promote healthy lifestyles. Non-active games can increase knowledge and influence behavior change. For example, a game targeting adolescent cancer patients improved adherence to chemotherapy and treatment plans. Games that promote skill-building, virtual immersion in stories via avatars, goal setting, and situation simulation have shown promise in changing behavior; specific outcomes vary depending on game complexity. Video games also have shown success in improving cognitive functions in healthy older adults, including task switching, working memory, visual short-term memory, and reasoning. offer a variety of active games from boxing to tennis. Energy expenditure during active video games varies depending on weight, gender, intensity, and duration of activity. 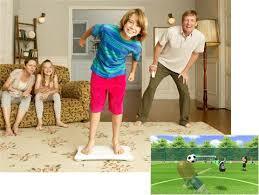 A recent study of Wii Fit games found that level of enjoyment influences frequency of game usage, thereby impacting energy expenditure. Aerobic games were found to produce greater energy expenditures than balance games (~ 2.7 kcal/kg-1/hr-1) although they were rated less enjoyable. Participation in aerobic games identified as more enjoyable produced greater energy expenditure than aerobic games designed to emphasize exercise alone. One variable related to health promotion is that the nature of many active video games is often intermittent there-by, detracting from the gamer’s ability to sustain movement and maintain aerobic exercise. For further information on the use of electronic media-based health interventions for promoting behavior change in youth (including physical activity and nutrition choices), see the systematic review by K. Hieftje —“Electronic Media-Based Health Interventions Promoting Behavior Change in Youth”, published in JAMA Pediatrics online April 8, 2013. Other electronic games have the potential to enhance motor learning and training for cardio- vascular and musculoskeletal systems, and balance. For example, a study of patients in intensive care units indicated that active video game use is feasible and can complement routine physical therapy intended to improve balance and endurance. Another study of patients with spinal cord injury who used active video games requiring only upper limbs demonstrated increases in metabolic rates. Some believe that more investigation is needed to determine how to best include electronic games in clinical settings without disturbing the clinician-patient relationship, citing concerns regarding efficacy, suitability and safety. The above is an excerpt from the full report of the AMA Council on Science and Public Health on the Health Benefits of Electronic Games — “Electronic Games and Health Promotion”. Houston Facial Plastic Surgeon, Russell W.H. Kridel, M.D., is current Chair of the AMA Council on Science and Public Health. Various individuals and organizations have referred to obesity as a disease dating back to at least the 17th century, and possibly earlier–Hippocrates recognized the increased mortality risk of being overweight. However, members of both the general public and the medical community remain divided on this issue. While some arguments focus on whether obesity meets or does not meet the criteria for a specific definition of disease, other arguments directly address financial incentives for research and patient care, as well as the ability to offer treatment. The financial and treatment arguments are particularly pertinent to the discussion of how classifying obesity as a disease might improve health outcomes; these arguments are considered in more detail below, along with arguments related to public policy, prevention programs, public perceptions and patient stigma. 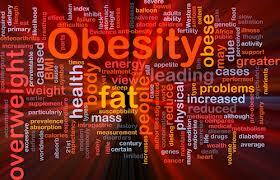 So, would classifying Obesity as a disease improve health outcomes? More widespread recognition of obesity as a disease could result in greater investments by government and the private sector to develop and reimburse obesity treatments. Some argue that the Food and Drug Administration (FDA) would face increased pressure to approve medications for obesity, and would therefore reframe their approval process to focus on the ability of pharmaceuticals to decrease adipose tissue rather than to improve other markers of metabolic health, such as blood pressure and lipid levels. There is current interest in developing a “limited use” approval pathway that could facilitate the clinical review and FDA approval of prescription drugs. Antibiotics and drugs to treat obesity have been identified as appealing candidates for such a pathway. More effective medications on the market would likely spur physicians to prescribe, and patients to expect, pharmaceutical interventions for obesity. In turn, third party payers would be harder pressed to deny coverage. 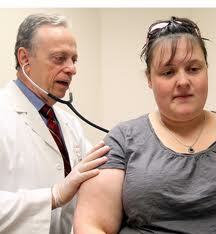 Public policy and prevention programs related to obesity may benefit from the greater urgency a disease label confers. More funding for obesity-prevention programs, particularly for children and adolescents, could lead to improved health outcomes for years to come. It is likely that a number of public policies related to healthy eating and physical activity, such as funding and regulations for K-12 meal programs and physical education, would receive greater attention and resources. Employers may be required to cover obesity treatments for their employees and may be less able to discriminate on the basis of body weight. Public perceptions may shift as a consequence of more extensive recognition of obesity as a disease, with greater appreciation of, and emphasis on, the complex etiology of obesity and the health benefits of achieving and maintaining a healthy weight.8 Lack of self-control, laziness, and other detrimental character attributes might be less likely to be associated with obese individuals, and in turn reduce stigmatization. 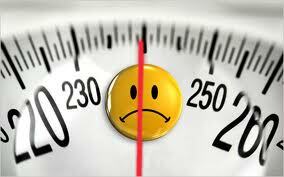 The disease label also may provide greater motivation for some individuals to lose weight or maintain a healthy weight. While increased emphasis on obesity may increase stigma (see below), some have argued that such consequences would oblige the medical community to take greater action to protect patients’ rights. Concern exists that more widespread recognition of obesity as a disease would result in greater investments by government and the private sector to develop and reimburse pharmacological and surgical treatments for obesity, at the expense of clinical and public health interventions targeting healthy eating and regular physical activity. “Medicalizing” obesity could intensify patient and provider reliance on (presumably costly) pharmacological and surgical treatments to achieve a specific body weight, and lead to prioritizing body size as a greater determinant of health than health behaviors. Given the limitations of BMI (discussed above), this could also lead to the overtreatment of some people, such as those who meet the criteria for obesity, (i.e., BMI > 30) but are metabolically healthy. A similar concern is that obese individuals, who improve their eating, physical activity, and sleeping habits, yet fail to lose enough weight to change their BMI classification, would still bear the “diseased” label and be pressured to receive medical treatment by clinicians, health insurers, and/or employers–even though their improved lifestyle behaviors are significant factors in preventing, delaying, and reducing the severity of obesity-associated outcomes. While some argue that BMI should be excluded from the definition of obesity in deciding whether or not obesity is a disease, the fact remains that BMI is currently the prevailing clinical measure of obesity. It is possible that public policy and prevention programs related to obesity may be diminished if increased government financing of research into medical treatments reduces funds available for public health prevention programs. Similarly, the medicalization of obesity could detract from collective social solutions20 to environmental forces that shape people’s behaviors and impact a number of conditions beyond just obesity. Thus, public efforts to enhance the built environment to make healthy eating and physical activity choices easier may receive less attention, despite providing substantial health benefits at every body weight; in turn, this could slow the improvement of health outcomes for all Americans. In addition, employers may raise health insurance premiums, limit hiring of obese individuals, and/or curtail employee wellness programs that incentivize weight loss or maintaining a healthy weight. Public perceptions may shift as a consequence of more extensive recognition of obesity as a disease, but not in a manner than improves health outcomes. For instance, some individuals may conclude that health behaviors matter little in disease development and management, which may decrease their motivation to eat healthfully and be physically active. In addition, an increased clinical emphasis on obesity could potentially offend or otherwise alienate some obese individuals, particularly if the emphasis is on achieving an ideal weight rather than healthy eating and physical activity behaviors.19 Assuming the current BMI cut-points remain the primary clinical indicator of obesity, such stigma would likely also impact people who are otherwise healthy, but who nevertheless meet the criteria for obesity (BMI > 30). If obesity is to be considered a disease, a better measure of obesity than BMI is needed to diagnose individuals in clinical practice. Further research is also warranted into the physiologic mechanisms behind why some obese individuals (e.g., the metabolically healthy obese) do not develop adverse health outcomes related to excess adipose tissue. This is particularly relevant given the difficulties most people have in achieving sustained weight loss. In addition, much more research is needed to develop effective and affordable obesity prevention and management strategies at both the clinical and community levels. The above is an excerpt from the full report. To read the full AMA Council on Science and Public Health Report on “Is Obesity a Disease?” click here. Pharmacy compounding involves the preparation of customized medications that are not commercially available for individual patients with specialized medical needs. Traditional pharmacy compounding involves the act of combining, mixing, or altering ingredients to prepare a customized medication for an individual patient upon receipt of a valid prescription for the compounded product. Driven by medical needs, cost issues, physician preferences, and in some cases drug shortages, the compounding industry has evolved over the past 20 years to include high capacity, industrialized practices involving batch production. Such products often enter interstate commerce and are delivered to health care settings in the absence of a specific patient prescription. In contrast to FDA-approved drugs, pharmacy compounded products are not evaluated for safety and efficacy, can be exempt from current good manufacturing practice requirements (cGMP), and lack standard product labels and instructions for safe use. Compounding pharmacies also are not required to report adverse events to the FDA. Nevertheless, despite the fact that all compounded products are viewed by the FDA as “unapproved drugs,” their availability has become an integral part of the daily practice of medicine and pharmacy in this country. The current “market” for pharmacy compounding comprises a diverse array of practices,some of which overlap. These include: traditional compounding, anticipatory compounding, hospital pharmacy-based compounding and hospital outsourcing of sterile compounding services. The United States Pharmacopeia Convention (USP), publisher of the United States Pharmacopeia and the National Formulary (USP–NF), the official compendia for drugs marketed in the United States, developed a set of enforceable compounding standards for practice. 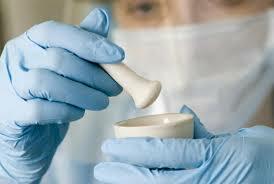 Compounding pharmacies are licensed and regulated by their respective state boards of pharmacy. 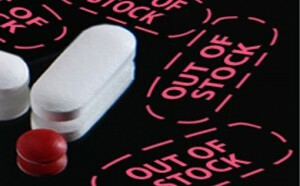 Some states require adherence to USP standards, while others rely on their own regulatory standards. In an effort to improve standards, the Pharmacy Compounding Accreditation Board (PCAB) was created in 2006 through the combined efforts of several national pharmacy organizations and USP. The mission of PCAB is to promote high quality pharmacy compounding through a voluntary accreditation program that recognizes adherence to established principles, policies and standards. PCAB accreditation gives patients, prescribers, and payers a way to select a pharmacy that meets or exceeds USP’s quality standards. PCAB accreditation means the pharmacy has independent, external validation that it meets nationally accepted quality assurance, quality control, and quality improvement standards. 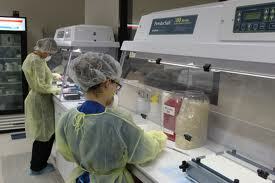 However, only about 200 compounding pharmacies are currently accredited out of an estimated total of 7,000. A searchable state-by-state listing of accredited compounding pharmacies is maintained on the PCAB website. The FDA also can conduct “for-cause” inspections based on complaints. Some risk factors are common to both patient specific and batch pharmacy compounding such as; facility characteristics, personnel training, level of standardization, verification mechanisms, and compliance with standard operating procedures. For patient-specific compounding, beyond use dating and storage outside of the pharmacy also need to be addressed. For sterile batch compounding, standard operating procedures, segregation of materials, batch sizes, in-process checks, and sterilization methods assume increasing importance. The larger the operation, the more closely these processes should be aligned with cGMP. Product quarantine, assurance of sterility, and recall mechanisms are necessary requirements for compounding manufacturers, not to mention assurance of batch potency. Product volume and whether the facility attempts to generate product beyond its capabilities or to fill a temporary gap created by commercial drug shortages represent other categories of risk. Finally, distribution, storage, and repackaging practices also are relevant. According to the National Conference of State Legislatures, several states have introduced bills related to the regulation of compounding pharmacies. One issue is potential limits on office-use dispensing, or the practice of physicians obtaining compounded products without a patient prescription to be used in an office setting. At the state level, interest is moving in the direction of regular inspections, composition of state boards to include the relevant expertise for addressing sterile compounding issues, and more widespread adoption of USP standards for sterile compounding. In early May, bipartisan legislation intended to clarify oversight for pharmaceutical compounding was introduced in the Senate (S. 959−Pharmaceutical Compounding Quality and Accountability Act). This goal of this legislation is to establish a clear boundary between traditional compounders and compounding manufacturers, and establish uniform federal quality standards for compounding manufacturers. 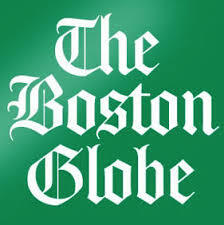 The legislation also prohibits the compounding of certain categories of drugs. It also preserves the state’s primary role in the oversight of traditional pharmacy compounding, and permits limited quantities of products derived from anticipatory compounding, although biologics would be excluded from this practice, except in narrow circumstances. The AMA submitted formal comments on the draft legislation, but it is not clear at this time how quickly this bill will move or what the final elements will be. The Senate cleared a key hurdle Tuesday for a bill intended to increase oversight of compounding pharmacies — which operate like drug manufacturers but have been regulated loosely. Tuesday’s procedural vote in the Senate was the most significant test, requiring a 60-vote majority. It passed, 97 to 1. The House has already approved the measure. 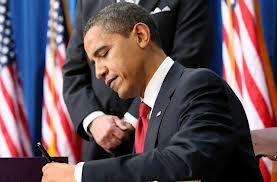 IT is expected to reach President Obama’s desk this week, once the Senate takes a final vote. 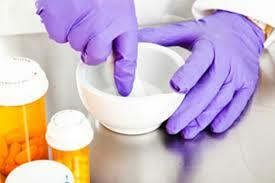 The use of compounded products is deeply embedded in the U.S. healthcare system. While traditional compounding pharmacies licensed and regulated by states continue to provide important patient-specific services, the overall practice of pharmacy compounding has evolved into an industrial-scale national business. Given the evolution of the pharmacy compounding industry, the current reliance of the healthcare system in this country on compounded drug products, and the accumulation of patient harm, the Council believes a clear need exists for more effective and appropriate oversight. A need exists to establish a clear boundary between traditional compounders and compounding manufacturers and to clarify specific areas of jurisdiction for the FDA and state boards of pharmacy. Because of the extensive array of current pharmacy compounding practices, and dependence of the healthcare system on such products, changes to the current system must be accomplished in a stepwise manner and in a way that does not otherwise jeopardize patient care. In the absence of a suitable FDA-approved product, allowances also should be made for the conduct of compounding practices that can supply products needed to manage urgent and emergent care scenarios in a safe manner. 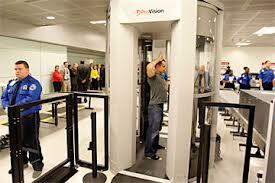 Is it safe to go through the full body x-ray scanners at airports? 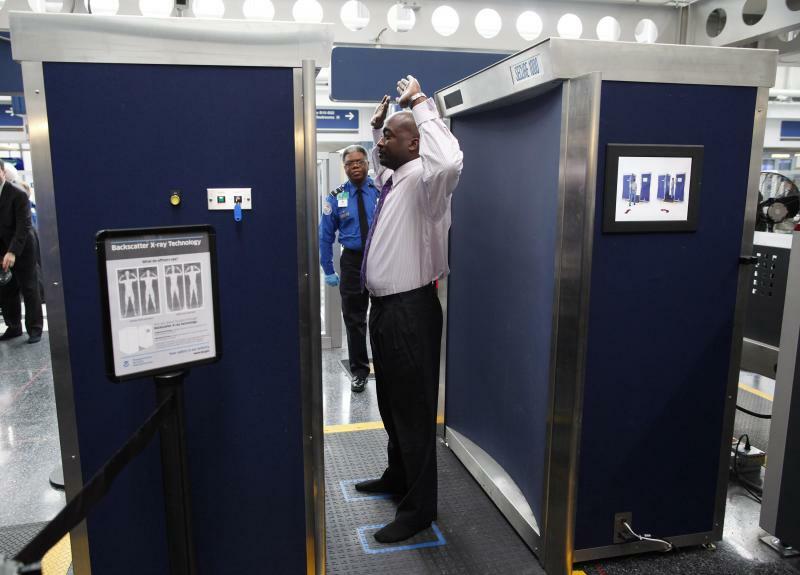 Several years ago, the Transportation Security Administration (TSA) began installing and using advanced imaging technology (AIT) at airport passenger screening checkpoints as a secondary measure to detect security threats. By early 2010, AIT was widely implemented as a primary measure because AIT is more effective at detecting weapons, explosives, and other hazardous and/or concealed items hidden under clothing than older metal detector-based screening units. The two main types of AIT used are “backscatter” models, which use low levels of ionizing radiation, and “millimeter wave” models, which use radio waves. Debate centers on exposure to ionizing radiation from backscatter screening. Although, backscatter units use extremely low levels of ionizing radiation, concern exists that any increase exposure to radiation is biologically dangerous. Although few data exist about the safety of millimeter wave scanners, they are not believed to have carcinogenic potential, so the focus of this discussion is on backscatter screening. Ionizing radiation refers to radiation that has sufficient energy to ionize atoms or molecules (cause separation of electrons from an atom) in biological systems. The electrons and positively-charged ions released as a result of ionization can cause cellular damage. X-rays, gamma rays, beta particles (high-speed electrons), neutrons (heavy uncharged particles), and alpha particles (heavy charged particles) are the principal types of ionizing radiation encountered. Of these types, x-ray and gamma rays have the lowest rate of energy transfer. Backscatter scanning units direct an x-ray beam over the surface of the body; the x-rays are low intensity, and therefore do not travel deep into tissues or through the body as those of a medical x- ray would. Instead, the majority of the rays are reflected back from the skin. Detectors translate the reflection pattern into an image that is examined by security personnel. The backscatter pattern is dependent on material property, and thus distinguishes between organic and inorganic materials. 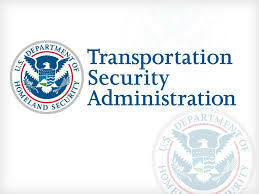 The imperatives raised in these resolutions are diminished somewhat based on the U.S Transportation Security Administration’s (TSA) decision in early 2013, to remove the backscatter models from U.S. airports by June 2013 and replace them with millimeter wave models. This followed an October 2012 announcement that the TSA had removed backscatter scanners from the majority of large airports, placing them in smaller airports. According to news reports, the backscatter models removed from airports in 2013 will likely be placed in federal buildings and other locations in which security measures are needed instead. However, depending on the frequency of exposure for employees and visitors of locations in which the backscatter units may eventually be placed, the concerns raised in the Council resolutions continue to warrant examination. that passengers should avoid being screened by backscatter scanners. However, it supports continued research on the safe use of the scanners, as well as maintenance, calibration, survey, and officer training procedures that are meant to ensure that the units operate as intended. The Council notes that passengers who do not wish to undergo backscatter screening may opt for alternative screening. The Council also notes that no adverse health consequences are known to occur from millimeter wave models that have replaced the backscatter models. Read the full AMA Council on Science and Public Health Report on “Safety of X-Ray Security Scanners”. Electronic cigarettes, known as E-cigarettes, are not comparable to FDA-approved nicotine-delivery devices that have been shown to help people quit smoking. At this time, their dosage, manufacture, and ingredients are not consistent and the products are not clearly labeled, thus making their use by smokers wanting to quit an uninformed proposition. More importantly, the manufacturers of e-cigarettes have not submitted the requisite applications for FDA approval of these products for smoking cessation. Only one small clinical trial, funded by an e-cigarette manufacturer has been published on their efficacy as a smoking substitute (but not as a cessation aid). The FDA has rejected claims by e-cigarette makers and distributors that their devices are safer than real cigarettes and mitigate the harm of smoking. While some distributors have implied that their products help people quit smoking tobacco products, the FDA views them as unapproved synthetic nicotine delivery devices with unknown safety and efficacy. Whether e-cigarettes can safely help people quit smoking also is unknown, but with their fruit and candy flavors, they have a clear potential to entice new smokers, especially teens. In addition, because of the unregulated dosing of nicotine, they clearly can be addictive. It is evident from what little information we have that the concentration levels of the nicotine and other compounds are variable, and that there are toxins and carcinogens present. Thus, controlled trials and test market studies are needed to determine if they are safe and effective as a smoking cessation device as is being reported in the media and on the manufacturers’ Web sites. Similar to concerns regarding the manufacture and sale of tobacco products, the actual content, performance as a nicotine delivery device, safety, and purity of e-cigarettes is largely unknown. Due to the lack of rigorous chemical and animal studies, as well as clinical trials on commercially available e-cigarettes, neither their value as therapeutic aids for smoking cessation nor their “safety” as cigarette replacements is established and remains speculative. What are some easy steps I can do to lose weight and reduce sugar in my diet? Here are 6 simple and easy steps you can take right now to lose weight and get started on a healthier lifestyle. Drink 1 less sugar based drink a day — with the goal of no longer having it as part of your daily diet. Downsize your drink. Ask for a small instead of a large. For example, a super-size soda contains the equivalent of 4 or 5 regular 12 ounce cans, which contains about 48 packets of sugar and has 720 calories. Replace one sugary drink with water every week. 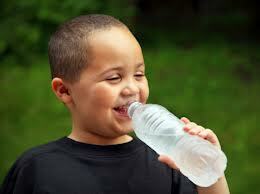 Substituting water for one 20 ounce sugar-sweetened soda will save you about 240 calories. Switch from fruit juice to real fruit. Fruit juice has added sugar. Stop drinking energy or sports drinks. Water is all you need to stay hydrated, even when you exercise. If you are a parent, don’t buy sugar-sweetened drinks. It is a lot easier to avoid drinking sodas and sugary drinks if they are not in the cabinets at home. Reducing intake of sugar-sweetened beverages is one of the simplest ways to reduce intake of added sweeteners. And, given the strong association of sugar-sweetened drinks with body weight and obesity, it is also a very simple way to reduce calorie intake and therefore lose weight. Certainly, it is most optimal to cut out sugar-sweetened drinks entirely. However, just by eliminating one sugared sweetened beverage (SSB) a day, you will be well on your way to better health. Read the AMA Council on Science and Public Health Report on sugar-sweetened drinks. Electronic cigarettes, known as E-cigarettes, are non-flammable devices that deliver synthetic or tobacco-derived nicotine; they are similar in size, shape, and usage to their leaf tobacco counterparts. They are available worldwide through the Internet or increasingly in retail outlets. However, due to the lack of rigorous chemical and animal studies, as well as clinical trials on commercially available e-cigarettes, neither their value as therapeutic aids for smoking cessation nor their “safety” as cigarette replacements is established and remains speculative. 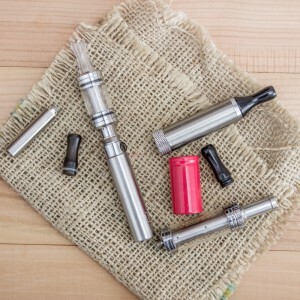 E-cigarettes consist of three integrated parts contained in a stainless steel shell: the mouthpiece (or nicotine cartridge), the atomizer chamber (or vaporizer), and a smart chip lithium ion battery. Typically, a disposable filter holds a cartridge containing synthetic nicotine dissolved in propylene glycol, water, and flavorings. When the entire unit is assembled, the user creates an inhaling motion which activates the battery via pressure sensors. 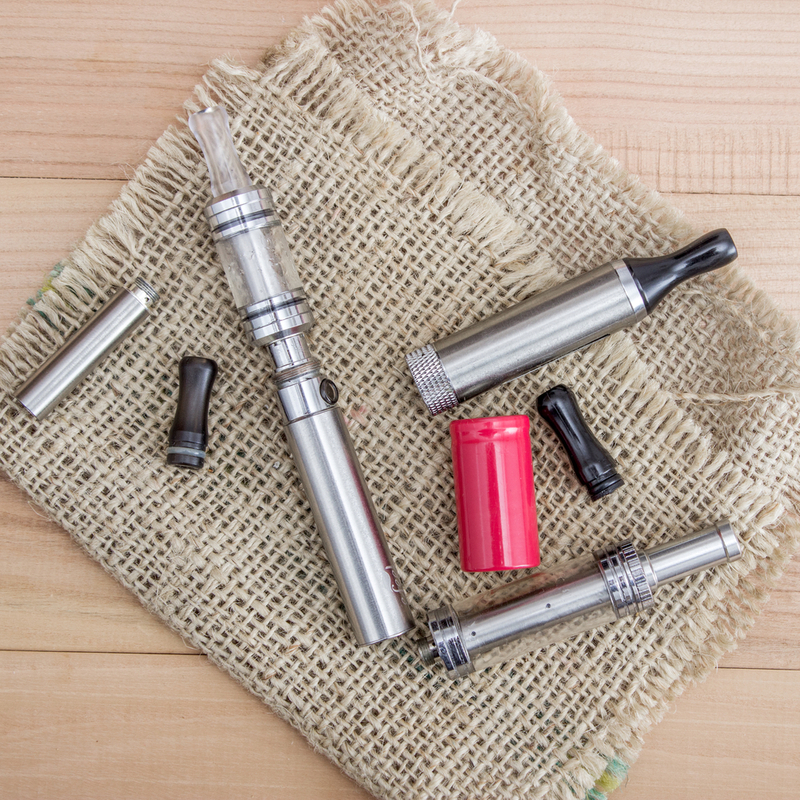 The battery powers the vaporizer, and the vaporizer heats the liquid housed in the mouthpiece. 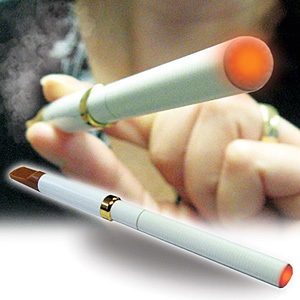 As such, the electronic cigarette is a delivery device for the addictive substance nicotine. The vapor released is polyethylene glycol (PG), which looks like cigarette smoke (also used for theatrical smoke) and is also an FDA-approved food additive. 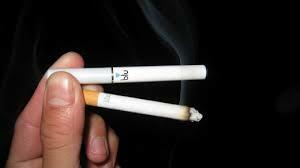 The volume released varies by brand, but when inhaled feels like cigarette smoke to users. Unlike tobacco smoke, the vapor quickly evaporates, leaves no remaining odor, but the secondhand smoke may still be irritating. Compared with conventional cigarettes, which last for about fifteen puffs, e-cigarettes can sustain 150 to 300 puffs, the equivalent of one-half to one pack of cigarettes. 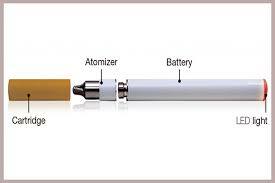 The cartridges vary in nicotine strength, being characterized as “zero,” low, medium, or high. 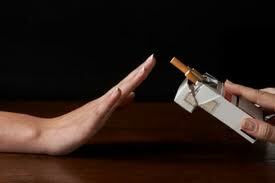 Disposable, non-refillable versions, equivalent to one or two packs of cigarettes, also are available. In tests conducted by the FDA’s Division of Pharmaceutical Analysis on two brands of e-cigarettes, additional ingredients were detected including diethylene glycol in one cartridge (a component of antifreeze and toxic to humans) and tobacco-specific nitrosamines (a known carcinogen) in half of the samples. This is very concerning and adds to the premise that such items should be closely regulated. E-cigarettes were invented by an employee (Hon Lik) of a Chinese electronics company (Ruyan) headquartered in Beijing, which began marketing e-cigarettes in 2004. The Ruyan Group remains the leading manufacturer of e-cigarettes (sold as Ruyan® e-cigarettes), but additional manufacturers using similar devices have subsequently entered the market, offering their products worldwide via the Internet, in shopping malls, and other distributors. Prices for the devices (a charger, rechargeable battery, and five nicotine cartridges) range from about $80 to $150 with packages of replaceable cartridges, each good for several uses, costing $10 to $15 or the equivalent of 1 to 1.5 packs of cigarettes. Per the CSAPH report, manufacturers of e-cigarettes have not submitted the requisite applications for FDA approval of these products for smoking cessation. 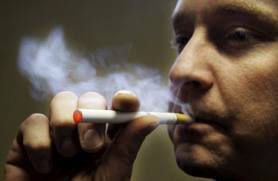 And the Food and Drug Administration (FDA) has warned the public against e-cigarettes, saying they cannot be considered legitimate therapy for smokers to quit and that they could turn children into smokers. Questions answered by Russell W.H. Kridel, M.D. as a public service to patients concerned about current health issues. All of the facts are gathered from published reports of AMA Council on Science and Public Health and approved by the AMA House of Delegates.